The lovely post at stevereads on I am the Mummy Heb-Nefert had me thinking all day about children’s picture books. At 8 (almost 9!) and 12 (almost 13! ), my own children have moved on, but I miss both the nightly ritual of reading aloud and the verbal and visual pleasure of their great collection of children’s books. How nice, then, to have an excuse to put together a “Top 10” list. Maybe some other time I’ll do a “Top 10 board books,” since it seems a shame not to have included Eating the Alphabet or The Going to Bed Book. 2. 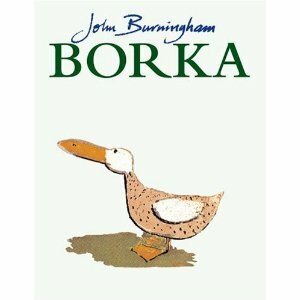 John Burningham, Borka. It’s hard to choose which John Burningham book is my favorite, but in the end, the nod has to go to the ‘Adventures of a Goose with no Feathers.’ If I had gone to Kew Gardens on my trip to England last year, I would definitely have tried to find “a goose who looks somehow different from the others.” My family had a budgie named ‘Borka,’ in his honor. 3. Robert McCloskey, Blueberries for Sal. Another tough call here, with Make Way for Ducklings close competition, but I always loved the “kuplink! kuplank! kuplunk!” of the berries landing in Sal’s bucket, and the endpapers of Sal and her mother in the kitchen. 4. 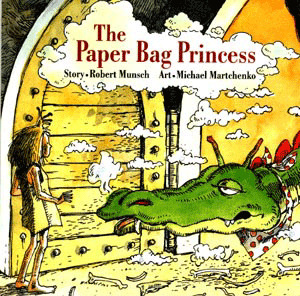 Robert Munsch and Michael Martchenko, The Paper Bag Princess. There are lots of revisionist princess stories now (I also like The Princess and the Dragon, and Princess Smartypants), but this is the best of them all. Every girl needs to practice Elizabeth’s parting shot: “You look like a real prince, but you are a bum.” Really, it’s a key to reading Jane Austen, all in one line. 6. 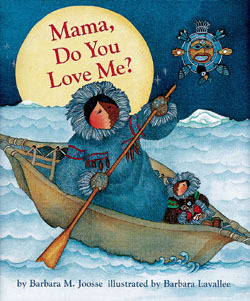 Barbara M. Joosse and Barbara Lavallee, Mama, Do You Love Me? Yes, dear one, “I’ll love you until the umiak flies into the darkness, till the stars turn to fish in the sky, and the puffin howls at the moon”–even if you put lemmings in my mukluks. It’s a unique, beautiful, and gently whimsical look at the universal strength of mother love. 7. 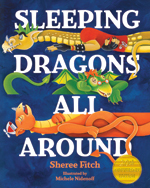 Sheree Fitch and Michele Nidenoff, Sleeping Dragons All Around. Another Canadian classic, enormous fun to read aloud, though it may make you hungry for Mocha Maple Chocolate Cake. Be careful not to wake the dragons as you go! 8. Quentin Blake, Fantastic Daisy Artichoke–no, Mrs Armitage on Wheels–no, wait, definitely All Join In–no, sorry, the best one is Lester at the Seaside–or, hold on: yes, that’s it, Snuff! Snuff rocks. 9. Shirley Hughes, Alfie and Annie Rose. Or Alfie’s Feet. But Alfie and Annie Rose always made me happy imagining my own children, also big brother and little sister, holding hands as they headed into the future. 10. Rick Walton and Page Miglio, So Many Bunnies: A Bedtime ABC and Counting Book. The kids, Maddie especially, just loved this one. I think it was the rhythmic combination and counting and rhyming–and the pictures (though actually a bit insipid for my taste) are very sweet. Also, I could always sympathize with that poor Mother Rabbit, who couldn’t help loving them all to pieces even when they undid all her hard work of putting them safely into their beds! Oh dear. I’ve reached 10 and haven’t included Where the Wild Things Are, or Joseph had a Little Overcoat, or Kevin Henkes’s Owen–or Lily and the Purple Plastic Purse. Or Olivia, or Lullabye Hullaballoo, or The Library . . . So, two questions for you. First, what are a couple of your favorite children’s books? And second, do you ever buy them for yourself, now that you’re all grown up, just because they are so enticing? I admit, I’ve already checked, and I am the Mummy Heb-Nefert is available to order. . .better yet, I might be near Woozles tomorrow. Maybe they have it! Next Article This Week in My Classes – Yes, Really! I read all those picture books up there! They are all mine! I read Felix Salten’s Bambi about 30 times as a child…this is the Bambi before Disney made a mess of it, mind. 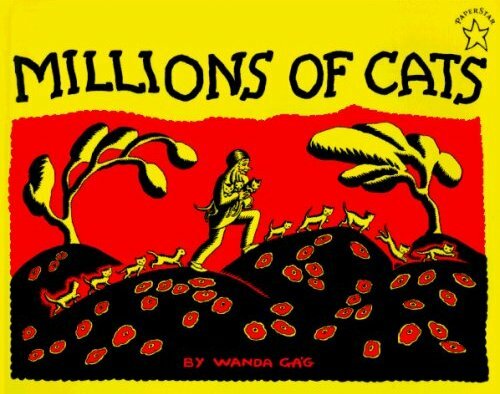 Also, I had a favourite book that I can’t recall the name or author of but I would die to get a copy now. It was about a bad girl in this small town whose badness comprises, primarily, hanging upside down from trees so everyone could see her knickers. One day, she falls into a well and dies (!) and her spirit possesses a good girl who starts the whole tree/knickers scandal again. Someone realizes she’s been possessed and cuts a hole in her toe so the spirit can leave and all is well. Nutty. Also, possibly eastern European. I love all the books aove that i’ve read, and I’m adding the others to my list to pick up. See, I have a toddler, so I get the great privilege of still reading picture books on a regular basis. One of my favorites still is Goodnight Moon. I just love the calming rhymes of that one.